People struggling with hair loss should consider enrolling in a clinical trial. These studies are developing better treatments that can help save or even grow back more hair. Research has also provided great insight into what may be causing more cases of hair loss. Volunteers who qualify may benefit from an experimental therapy not yet available on the market. Subjects in a hair loss clinical trial are monitored closely to determine the effects of the applied treatment. Investigators mark the progress for each participant over the course of the study period. There is typically a follow-up period after the treatment phase of the hair loss clinical study where participants will need to come in for further evaluation. If you’ve been experiencing some recent hair loss, then you can take a more proactive step by participating in a clinical trial. Below you’ll see a list of active hair loss clinical trials from around the country. Learn which trials are being conducted locally and what you’ll need to know prior to enrollment. Hair loss (also known as alopecia) can affect the scalp or other parts of the body. This is a medical condition that can impact anyone – men, women, and children. Once hair loss begins, some people choose to let it run its course without being treated or hidden. People who do wish to hide their hair loss may attempt to cover it with certain hairstyles, hats, or even makeup. It’s strongly advised that you talk to your doctor before pursuing any serious form of treatment for hair loss. Some cases of hair loss may actually go away on their own without the need for any form of treatment. Contemporary treatments are used to promote renewed hair growth or hide the hair that has been lost. The prescribed treatment really depends on the underlying cause for the hair loss. There are a few different medications that can be prescribed for more severe cases of hair loss. 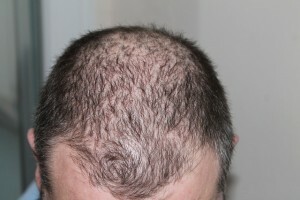 Some treatments – like rogaine – are available over-the-counter. These come in either liquid or foam and are rubbed into the scalp a few times a day to promote hair growth. There are also surgical procedures available for hair loss. Many people have opted for hair transplants which make use of artificial plugs or healthy hair follicles from another part of the scalp. Please remember that surgical treatment for hair loss can be very expensive and there are potential side effects.